It’s one of the most devastating news an athlete encounters, ankle surgery. The injury itself is lousy, but surgery usually means time off. “I had an MRI and X-rays done. Turned out I had been playing on torn ligaments and cartilage since 2014,” says Kyle Harrison. Ankle operation meant missing the first half of the 2017 Major League Lacrosse season. However, with plenty of rest time and tons of rehab, Harrison shares with us the seven lessons he learned from his ankle injury. “Don’t be the tough guy and wait to get your ankle checked out,” shares Harrison. You want to be healthy and perform at your best on the field. If you wait too long to get your ankle checked out, then you’ll struggle to achieve your best, and you’ll have a longer recovery time. “You know being healthy is the most important thing. Maybe get surgery immediately, because the doctor was like, ‘We can leave it, and you can play on it, just I can’t promise you that 10 years from now when you’re running around in your backyard with your kids, that it won’t hurt.’ Like, ‘Okay. This is too much. Let’s get surgery.’ I don’t have time to be not being able to play with my kids because I tried to tough something out,” expresses Harrison. If you have some injury, or you feel like something’s not right, get it checked out. “Like get it actually checked out. And make sure you’re listening to the people that can tell you exactly what’s going on,” suggests Harrison. Whether it’s a few days of rest or surgery, the biggest thing you’ll need is support. Harrison’s family helped him through surgery, and he listened to the experts to put in the hard work to recover. It’s not going to happen overnight, but if you put in the hard work and listen to your physical therapists and doctors, then you can recover strong and get back to the field. “You have to trust that you’re putting in the work, right? Like, I went to PT every single day, morning and night. And I ate the way they told me to eat; I did all the exercise they told me to do. I did everything that the experts to me to do. Rather than sitting around questioning whether I can do something or not, I just followed their steps. I focused on that rather than self-doubt,” shares Harrison. For a guy like Harrison, baby steps to recovery were hard. Being on a scooter and having a two-year-old who wants to play all the time was a challenge for Harrison. But, changing his mindset and being patient was what he needed to go through the small steps to have a healthy recovery. “The hardest part for me mentally once I was done with surgery, I was ready to go, go, go. I was like let’s build up the strength, build up everything that I’m going to need to perform. Let’s build it up,” shares Harrison. The first 4 to 5 weeks were the toughest because Harrison could not do much of anything. Just rest, small movements, and patience. As an athlete, you burn lots of calories, from training to game day. You need food to fuel the energy you burn. And sometimes you can indulge. But, when not training, you can’t eat whatever you want because you’re not as physically active. “I think I’m one of those guys and I always have been, I’m not crazy with nutrition. I don’t go overboard, but if it’s food I want to eat, I eat it. But you know, you’ve got to think smart. Being smart about soda, being smart about fries. All the stuff that historically makes you gain weight. As a guy, for five weeks, I can’t run, so I can’t just be over here eating cheeseburgers, you know? It’s not a thing. I’m not able to go work out and do cardio and those type of stuff,” says Harrison. When you have the green light to go back on the field, you should practice sport-specific movement to make sure your ankle is healthy to perform well during the game. For Harrison that was tricky because for Major Lacrosse League (MLL) the players don’t practice during the week together. They just have their game on Saturday. For Harrison, learning what he can and can’t-do on the field is what he needs to practice and gain ankle strength off the field. So, he works with his physical therapists and pushes himself. He prepares himself for all the balance change and quick movement that needs to happen on the field. Whether it’s a workout or game, it’s essential to warm up your ankle (or injury) and give it a nice cool down after to prevent any further damage. “I do flexing and calf stretching to loosen up my ankle before a game or exercise,” says Harrison. 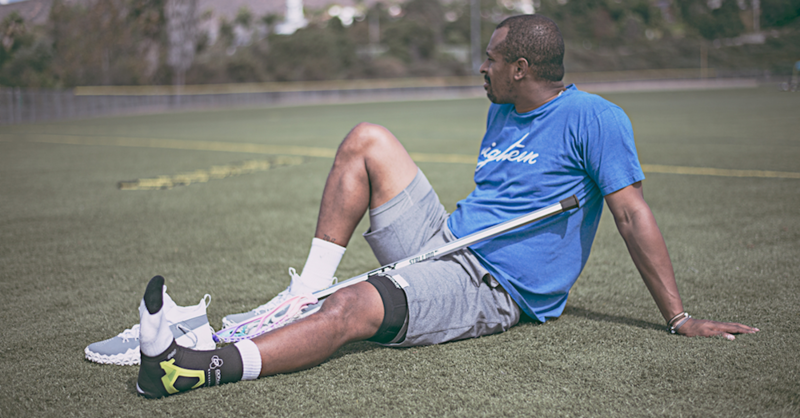 After his workouts and games, he rolls his calves, massages out scar tissue and lactic acid, uses a Compex® device, and applies ice to his ankle. “I know patience and doing the right work now will help me perform my best on the field,” Harrison expresses. Harrison is the former number one overall pick in the 2005 Major League Lacrosse draft. A five-time MLL All-Star, he has been a member of the Ohio Machine since 2014. Shop now for an ankle brace. Kyle Harrison is a DonJoy Performance® sponsored athlete.